There are many exciting benefits for practices that make video visits available as an option for patients. Practices that do it experience increased revenue opportunities, more flexibility for providers, and more efficient use of office staff. Of course, telemedicine won’t get your practice these awesome outcomes if patients won’t use it. That’s why it is important to help them get comfortable with the approach. Here’s how. Quality of Care: Make sure that patients know that you will only schedule video visits for appropriate interactions. You should emphasize that not every situation is right for a video visit and that your staff is trained to know the difference. Security: It is important to let your patients know that you have been very thoughtful about the telehealth solution you use and that it is compliant with HIPAA laws designed to protect their privacy. Cost: Many patients may not be aware of parity laws that require insurance companies to cover video visits. You should assure them that you’ve implemented technology to double check that their visit will be covered by insurance. Patients won’t request a video visit if they don’t know that you offer them, so be sure to market the service. Flyers and posters in the office are a good approach. 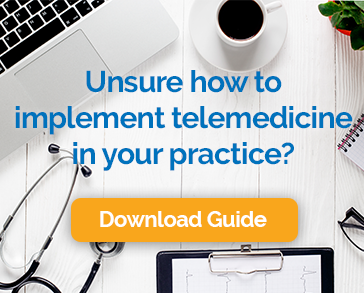 You might also add something about it to your automated voicemail attendant so that when a patient calls to make an appointment, they are reminded about the option. It is also very effective to bring it up during in-person visits. You might mention that the next time a similar situation occurs; remote treatment would be an option. Finally, for the treatment of chronic conditions, or lifestyle coaching, you might actually prescribe video follow up. Telemedicine is becoming much more mainstream. These days it doesn’t take much to convince most patients that they should give it a try. If you keep open the lines of communication and make a point of promoting the service, you’ll start to grow that part of the practice in no time.